The story of my flood several days ago continues. We have had several days of workmen on the roof. The temperature has been steadily climbing again after an almost bearable 32 C four days ago and today hit 40 C again - unfair really in late September. This makes Ramadan hard and my guards in their heavy suits seem to wilt after midday. I have three fans out on my balcony and I am not brave enough to use them. There is a beautiful bronze pigeon nesting on the top of one - right where she would be swept off, nest and all if I turned it on. Worse - I have three remotes and they are fan-specific. I pressed the button on one and pointed it at one fan, and a different fan went on - not, thank goodness, the one with the nest. On the roof you could add a good five degrees to that temperature at ground level. It doesn't help that it is a concrete expanse with zero shade for most of the day. 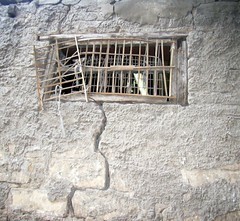 For days the men have been working in extreme difficulty on the split pipe which is most awkwardly placed about half a metre over and almost a metre down from the edge of the low wall around the roof. This is a very sheer wall about three and a half stories high. Worse - our ceilings are incredibly high and while it makes the rooms cool and very beautiful it makes hanging over the edge of the roof likely to be lethal. The pipe has been resisting all help offered. They have managed to replace a section - and what they did with cutting gear and two men hanging onto another's legs you do not want to know. It split again. Yesterday they seemed to be coming and going all day and it was truly hot. At five I saw them leave, and waved them off, only to realise forty minutes later that I could still hear hammering on the roof. It was almost Iftar and I had already taken out the meal we give our guard at this time. I just could not believe they were still there at Iftar. I pulled out a tray and realised that I was not not at all confident carrying a tray with five glasses and a lot of juice boxes up three flights of steep stairs. I shoved them into big plastic bags and rushed up, arriving just as the call to prayer started. The poor men did not even have water. The water had been off all day while they struggled with the pipes. Our lovely office handiman who supervises all workers in the house took the stairs two at a time down for water and brought up bottles for one for each man. I watched in amazement as they just upended the lot straight down their throats. I left them eating dates - very much part of the ritual, though better if they have been soaked in milk. They finished at about 7.00 and left. Today the pipe is leaking again. I am starting to think that this will be a very long Ramadan. Everything slows down here. While that is hardly surprising given the lack of food and water for all Moslems during daylight hours, it also seems to affect the expectations of things that might be achieved. There is an odd sense of hanging in midair until it is over. Staff come in as usual, but hours are shorter. The Embassy closes an hour earlier. The day seems to slumber until it stops completely as the fast breaks. There will be no-one on the streets. You almost have to know Cairo to know how really extraordinary that is. The day turns itself upside down with evening. Egyptians party in Ramadan. There is a free and vibrant buzz of expectation in the night streets. They look wonderful. 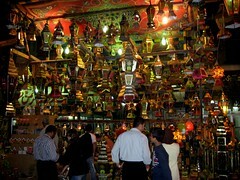 The lamps are vivid, and after the meal people pour out to see others, stand and eat in ice cream shops. Food sales double in Ramadan, and considering how few hours eating is permitted that is very surprising. Most Moslems actually gain weight. There is a ritual to breaking the fast. It is considered unwise to wolf down food. People pray first, and at the call to prayer they are sitting in front of food and drinks. I would head straight for water I think. The usual drink though is called Kameruddine - made of apricot leather soaked overnight in water and swirled to a darkish orange, thick, sweet and tangy drink. It was explained to me that this is a match for the salts in the blood and causes no shock to a body kept without liquid all day. Then they eat dates. In most other Moslem countries I have lived in these would be plain. 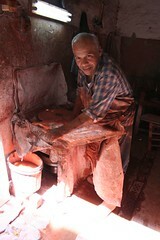 In Egypt it is more common to soak them in milk or to cook them lightly in milk with a little sugar. Sometimes the milk is thickened with dessicated coconut. There is a wait for a while at this point. After ten or fifteen minutes a little salad is eaten, slowly working up to a main course which will be rich with meat and vegetables and rice AND bread. Desserts are essential, syrup soaked, always Middle Eastern in style and very very sweet. This is like a carbohydrate packing after the meal - a way to boost calories to get them through to the end of the next day whould their resolve fail to get them up at three am to eat a meal that they often do not really want. There is a drummer who drives the streets of Zamalek on the back of a truck, playing a very very loud DUM dum did did did DUM DUMMITY....as he goes at three am. Thank goodness he misses this street. Last night just as the fast broke I realised that the neighbours had been washing their balcony for a good half hour - and it was a very odd time to do it. I could hear water pouring out and splashing onto the drive at the side of our house. At this point I got up to check. Our house is strongly floodlit at the side - a blaze of bright whitish-yellow light that shines through the huge etched glass art deco window to wash down the stairs so I never need to turn on an internal light to see as I move around the house. As I walked out onto the tiny balcony off the study I looked up into an amazing mist of light - myriad points catching the light and dancing slowly in the beam. Water cascaded from a pipe up near the roof level, but under such pressure that a fine spray filled the air around the stream. It was a waterfall complete with mist. I have to say I was less than entranced. I rang our admin officer and he made the necessary calls and rang back to say they would be here in half an hour. I had realised that the basement might well be filling up - but between calls had checked to find it was fine. There was a very large drain just below which was managing to dispose of most of the water. If it had found its way into the basement I would have had the swimming pool I have lusted after - right in the house! Both the Admin officer and I knew the half hour was probably a joke and it was. About two hours later I had three people here. There was a lot of hammering and talk, and an occasional new cascade of water when they turned on the taps to check progress. In the end they hammered a wedge of wood into the end of the pipe and left, promising to be back to finish the job 'bukra' (tomorrow). They have been but it is not finished yet - and they will be back again tomorrow. I have some photos for you to finish with. 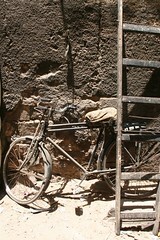 I know wall images are now so old and almost cliched - but I love the sense of buildup on Cairo walls in the older areas. It is a surface with a history and a sense of palimpcest - the term used (for those not into art) to describe the scraping back of vellum skins so they could be re-used - which always left a bit of the previous writing behind. So - nothing to do with Ramadan but just for fun. 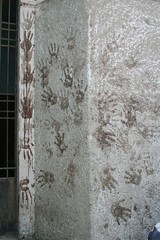 The handprints from last year's Eid - not the one after Ramadan but the next, when the sheep are sacrificed and people print the blood from their hands around the doorways. It is so strongly reminiscent of passover that I am sure there is a common base. It is Ramadan again. I was watching the BBC news last night and yet more horrors from Iraq when they commented that it was particularly sad that this atrocity had happened on the first day of Ramadan. That woke me up. I was horrified. We always feed our guards for Ramadan and I hadn't taken out a tray. I sat there all evening feeling guilty. This morning I rolled over and turned off the alarm on my mobile phone. I woke up, had a shower and came down to eat breakfast and have a coffee and have all food out of the way before my staff arrived. I hate eating around people who are fasting and all my staff are Moslem. My housekeeper was really surprisingly late. I greeted her when she came in and told her I had just been getting worried. She pointed out that it wasnot late -she was actually early but that the time had changed on Thursday. For the last three days I have been an hour out of kilter with the rest of the world and I didn't even notice! Then I apologised as I hadn't realised the day before was Ramadan. "No", she said. "First day is today" - except in countries to the east. 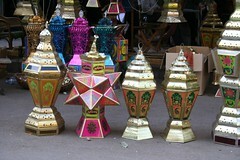 Special Ramadan lamps have been going up all over the city. Every building is lit and some have great strings of lights on them. The feeding stations are out and that means that many small streets are closed so tables can be placed in them as evening approaches. 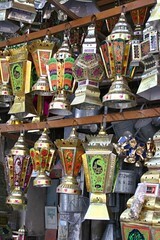 These are Ramadan lamps for sale in my very favourite area near the Tentmakers' Khan. At night they glow with the lift to the heart of a parade with drums. They are hard to photograph, and better with light coming through them than they are in the light of day, where they can look quite glitzy. Like Cairo, they look better at night. I love the ones with points like a Gaultier bra. They are really very cheap and one of a decent size is about ten dollars. 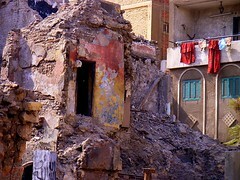 I have heard complaints that Egypt does not recycle its rubbish. While there is no formal separation of paper from glass and plastics, there is the constant recycling that comes with a very poor society. These boxes are some of my favourites. 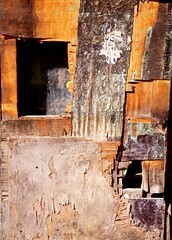 there are several men, all old and fragile and looking as if they are slowly drying down like dried bananas, who sit all day cutting out old tins that hold glues and industrial chemicals. 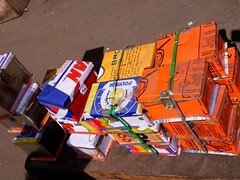 The chemicals and glues are dried and peeled out in long strips, and the tin cut into small pieces and fashioned into brightly coloured money boxes. These sell for so little it is almost embarrassing - about seventy five cents each. It would take half an hour to make a box. 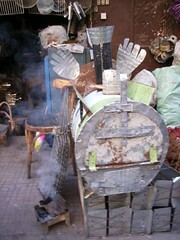 A slow walk up from port Said Street towards Bab Zuweilah takes you past so many wonderful shops and craftsmen. 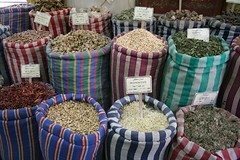 Spices and dried pulses are sold in open sacks, and the scoops used are fashioned by the tinsmith next door. This extraordinary machine is made to roast sweet potatoes. Coals are built up inside and potatoes placed around the rack above them and carefully turned for perfect roasting. When they are ready they are taken out and stacked around the chimney to keep warm. The fingers in the air have a double purpose - five Egyptian pounds for a large potato (though you can negotiate if it is small, burnt, or at the end of the day), and a rod to lock the door closed. The hand is also good luck. Sweet potatoes here are served as a dessert and never as part of a main course. It was quite disconcerting to order a restaurant's 'special' dessert to find I had a baked sweet potato with one scoop of ordinary white sauce on top. There is an area where whole treetrunks lie around waiting to be turned into chairs and tables, and bowls and planter stands - you think of it and they will make it. they work with bare hands and sandals and open whirring saw blades - horrifying to a previous safety officer! 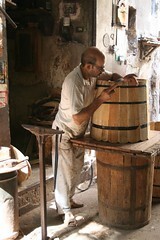 Coopers use the same wood to make barrels and planter pots. 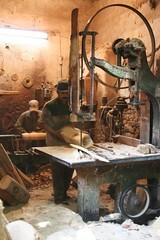 Finer woodwork is just around the corner with carved chairs, tables and the most enormous cupboards. I know very few of the local five and six and seven story buildings have lifts, so these have to be carried all the way up if they are purchased. Even in quite wealthy areas very few buildings will permit you to use lifts to carry furniture or refrigerators, so teams of labourers heft these up multiple flights of stairs. This man was sanding scratched and used sheets of glass - and he and everything within fifty feet was covered with fine red rosin. 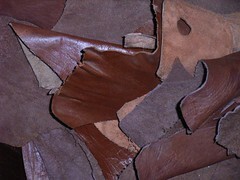 The leather souk sells dyed skins. The man on the right also shows another thing that is particularly obvious around Ramadan - and Egypt is the only place I have seen it. Many men here have large discolourations on their foreheads from consistent and frequent praying. Sometimes it is really raised and lumpy. The last location for today. This is the Tentmakers' Souk, where men sit crosslegged on benches appliqueing stunning Islamic patterns onto a soft thick cotton ground. 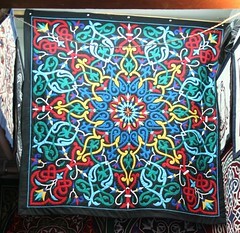 The patterns are very varied and rich, and colours are stunning. Egypt grows the best cotton in the world, but it is all exported to be spun in India and Pakistan. the cotton used by these men is cheap, bright and hard to work with (I've tried). They work with huge iron sheers, and none of the modern gadgets quilters of today are so fond of. 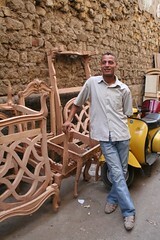 This is work by my friend Mohammed - one of the most skilled in the Souk. Watch for him in Melbourne this year at the Australasian Quilt Convention. See - I have my photographs working again! 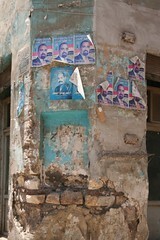 I have been keeping this blog very much as a report from Cairo. My life as a professional Quilter and teacher, public speaking and travel to other countries that I do in that role, and many other things that happen in my personal life do not make it to the blog. I am about to post one entry which will give my readers a little on the other life. On the 8th July my daughter Kim was badly burnt in Australia. She lives on a large country block outside the small city of Lismore in northern NSW and works at Southern Cross University there. They had been cutting back a large stand of bouganvillea which was taking over one section of the garden and providing shelter for snakes. Her arms were cut and scratched from working with the vicious thorns and dragging long whippy branches to a pile. When her husband wanted to take it to the tip she refused. She wanted to burn it so it did not have to be handled again. They did most of this by the book. Dean dug a pit the day before and the bouganvillea was put in it. They whippersnippered long grass from around the pit so the fire could be more easily controlled. She tied her lovely long hair back with a tie and put on sunglasses as she walked out the door to light it. She tucked in a couple of firestarters as there was water collecting in the bottom of the pit - Lismore is a wet area. Her husband was beside the fire with the hose running ready and she leant forward to light it. Unknown to both of them one of the boys had decided to help by putting accelerant on the bouganvillea. It was done earlier and he had wandered back inside intending to tell them, and forgotten. It had filled the pit in the form of hevy fumes and when Kim lit the match the whole thing exploded in her arms and face. She said it was incredibly beautiful - shimmering in gold and orange. Then she realised that she was the source of the colour. She 'dropped, rolled, rocked' as they teach the kids in school here. Her husband pointed the hose at her. Her son called the ambulance as she was too badly burnt for her husband to be willing to touch her. She was in Intensive care for a day as they thought there was serious burning to her neck and that she might have inhaled fire into her lungs. She did not, and this probably saved her life. Most people take a deep breathe to scream. I was teaching in Cape Town in South Africa when this happened and immediately tried to book a flight straight home. Bob managed to speak to Kim and said she sounded reassuring. I got through too and she told me the reason she had refused to allow Dean to even tell us for twenty four hours was that she was afraid I would fly straight back and she wanted me to finish the contract. She pointed out that although she had second degree burns to her hands and arms and face and some third degree areas on her arms and right hand she was not in danger, and was about to come out of Intensive Care. I stayed, but rearranged bookings to Australia to leave quickly one I got back to Cairo. At one stage it was thought that she would have to lose fingers, but they recovered. She was airlifted to Concord Hospital in Sydney which has a world class burns unit.It is a painful process, recovering form burns, and the treatment is a matter of endurance. Kim walked and walked - seven flights a day to the burns floor when they would let her out, convinced that exercise would help. She healed astonishingly fast, and at one stage doctors questioned her about the way she usually lived and ate as they could not explain the speed of her recovery. Southern Cross Quilters - an internet group I belong to - asked if she ould like 'healing hearts'. These are a heart stitched, appliqued or patched on a cream background for making a quilt to help with healing. Kim chose green, and they also decided that they would each send me one too, in an Australiana theme. Then the Canberra Quilters heard about it and they added their hearts too. The hearts just poured in. The first envelope arrived and we spread them out on the bed to look. Both of us were in tears - so much care and concern and love form people who did not even know my lovely daughter. Each has a message and a name on the block - often in tiny letters wrapping around the heart. I made her quilt just before I left Australia and quilted it. There were only three that did not get into the quilt, and a few more have arrived since. They will be cushions to match for her bed - at Kim's request. It was bound by a friend - Anne Eccleston - as I just ran out of time. The photographs were taken before it was bound. This is the quilt - and if you click on the image it will take you to the set - second block of images (with set, Kim's Quilt on it) down on the right of the Flickr site which hosts my photograpy. There are lots of details to show those who wish to see them the sorts of stunning blocks that people make. As a gift this is almost hard to describe. So much time given generously by so many many people. I am sure it helped Kim, and it certainly helped me. As I stitched around each heart I read them all again, and there were messages that made me cry. There are many hearts from people already fighting cancer and with other serious health problems. I know it helped Kim and it is as a thank you to all the 165 who helped with hearts that I am posting this blog. I had such a busy day two days ago. I had a good friend arriving the night before. Her father was already here so he wanted to meet her at the airport. At midnight I introduced Rod to our lovely taxi driver, Ibrahim. Off they went. I wrote a long and rambly blog entry - because I was tired and thought that would keep me awake. They arrived at two, but had to be in a cab by 7.00 am to join a tour which was, on day one, taking them to the Pyramids. There had been a brief flurry of panic with the realisation that Rod did not know which hotel they were to meet at, or what time - but Danielle had all this. They left, I headed home and packed quilts and my lap top. There was another flurry of panic when I realised that I didn't have the right adapter to plug in my computer. I was giving a talk to a large local women's group at the Marriot and while this house has British plugs, and my computer has Aussie plugs - the Marriot has the local two pin plug. The Embassy came to the rescue, at the last minute. The talk went well, though I felt I was fighting off efforts to purchase my work. I will not sell here - we had a quilt show through Libya, Syria and Egypt (all countries where Bob is Ambassador) and I am so afraid of complaints of conflict of interest that it seems easier not to make money from my profession here. Then - lunch with a group of dear friends, my 'swim girls' and a movie session. I arrived back at five, with a cocktail party - a farewell for Bob's number two in the Embassy and arms full of flowers I had picked up on the way. They are cheap here, and these were beautiful. I bought lots of tawny chrysanthemems as these are the colours in the lounge, babies breathe because I love its shimmer, and stems of tuberose for their scent (20 cents each stem) and pale creamy roses for the bathrooms. Waiters were setting up tables and the bar, the kitchen infused the house with good and savoury smells. Another flurry as my guests arrived and needed to borrow a sleeping bag. I left them burrowing in the back of the darkest cupboard under the stairs where the camping gear lives and went back to the flowers. Then one of the waiters asked which wines we were serving. This triggered a full scale panic! As far as I knew all the wine was still under lock and key at the Embassy (now closed). There is a law in Egypt that alcohol has to be locked up and we have a cold room under the house where it is usually kept. bob keeps the key. While we were away the room was repaired (damage from salination from the nearby Nile) and as far as I knew the wine was still elsewhere. A frantic phone call - and all was well. It had been delivered and stacked int he cold room the day before but no-one had thought to tell me that it was there. Wine was found. I showered in the nick of time. Our Charge d'Affaire was hosting the party so I just had to mingle and chat - so I was not on duty! I have been reorganising my Flickr membership. I had let my professional membership lapse, so could not create sets and link to them from here. I am so rusty - but will spend some time now following my blog angel's instructions to try to set up links. The photos are sets of the ones we gave away in the Khan a few days ago, and followed by some new photos we took at the request of those who were there when we were handing images out. If you click on the face of the old man it will open a set of other images for you to look at. This is the man who is the caretaker for a small and very old mosque - the Sufi Mosque, who sat us down and bought us 7-Up. I love the variation in the faces. There are more that we gave away - once again click on the image to see the set! I love this photograph. 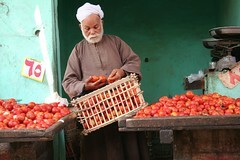 I did not want him to pose as I love the way he was going through his stock of tomatoes. They were sad tomatoes - and would have been discarded anywhere else - but he went through them all the time discarding only the worst as they wilted in the shimmering heat. It was a 'shoot from the hip shot' and I struggle a little with my conscience when I do this.I don't like to be sneaky but it gives very natural photographs - and a lot of views of ceilings. One of the next group might offend and for this I apologise - a small boy with his bottom very naked and sitting on a pile of potatoes - but it was a favourite and I have left it in. I did not buy potatoes though. This set is all photographs taken three days ago when Rod and I walked through handing out the photgraphs. It was exhilarating and you can read that blog if you wish! 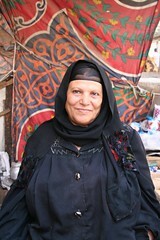 The first photo is the wife of the caretaker of the Mosque from the first set here. Once again - click to open the set. Skip the second with the child on potatoes if you do not want offensive detail. There was a stage today where I thought dry wood touched to my face just might burst into flame. It was 38 in Cairo today - and unusually quite humid. For those of you in the States that is 101 degrees. The sky looked blue if you looked straight up but when you flicked to the visible horizon it was oddly near - shimmery greyed-out buildings just on the other side of the Nile. It seemed an odd day to decide to walk up one of my favourite busy and heavily trafficked streets as it is angled at exactly the wrong direction for a shimmeringly hot day - so that nothing on either side really gives shelter from the sun at any point. However - I have a visitor with a camera and no place is better for photography than Cairo - and it was, after all, one of my favourite streets. We start on Port Said Street, just opposite the stunning Islamic Musem. I badly want to see this. I started the posting quite hopeful when we tried to go in my very first month. Two months was fine - so we went again. The guard on the door shook his head in sorrow. "Two months", he said. It has been two months - ever since - and my time is running out. 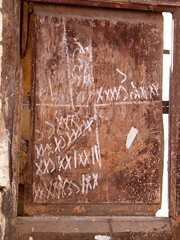 However, we have seen ladders hanging out of windows, and perhaps things are really happening. Maybe in two months I can get in. I didn't even look this morning. My favourite walk starts at the jail. The doors had just opened and a river of women in black, some with several small children were flooding through the gates to visit their men in this low security prison. Many carried fruit and vegetables and food. Life is hard for women in this country who do not have a man to support them and I slipped a few pounds as baksheesh to a lovely young woman in black who had a baby in her arms, two tiny children, perhaps twins, clinging to her skirts and far too much to carry in tightly packed black plastic shopping bags that were obviously cutting into the hand she held out to me. She lifted her chin almost proudly and indicated the prison with a quick tilt of her head. 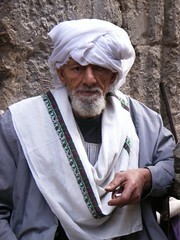 Baksheesh is a way of life here, and I tend to stock the side pocket of my bag with easily reached small notes. This street is my favourite because it is full of the absolute best of Egyptian life. It is a street of craftsmen, and we zigzag down the narrow road flicking back and forward to the most interesting tiny shops. It is friendly, but not insistent in the way of the Khan Al Khalili on the other side of the main road. I am digressing badly today, perhaps because it is well after midnight and I am waiting for another friend to arrive by plane - but I heard another wonderful spruiker line yesterday in the Khan. As I walked past one young man he said "Oh, you dropped..." and pointed quickly behind me. I quickly turned to look, though I had felt nothing fall. There was nothing there. Well - actually there were a lot of bits of plastic, some paper drink cups and other rubbish, but nothing I had dropped. I looked at him, eyebrows raised. "My heart" he said and clutched his chest. Back to our walk. On the right side of the street is shop after shop selling marble and granite. It is stunning and cheap - but hardly the sort of thing you throw into your cabin luggage. A slab of deep green marbled in white about the size of a large kitchen bench top is about 65 Aussie dollars. Some of the men make inlaid tables, but many are making signs for offices and businesses. 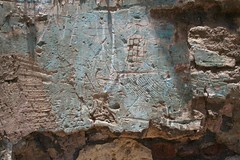 The flowing arabic script is pencilled in, then a sharpened concrete nail is belted along the lines with a hammer, cutting long smooth curves with a deeply incised sharp point at the bottom. This is filled with black enamel paint which is freely slathered over the whole surface. Then the surface is polished back, paint removed in the process except where it is in the deep grooves, and the sign is done. The men are grey with marble dust, and wear no protective gear at all. We passed coopers making metal-belted barrels, saddlers with decorated saddles, plain leather saddles, and full complements of brass hands and bits to hang on jingling harnesses, an area where beautiful wooden bowls and rough furniture is turned on the spot from treetrunks delivered whole, tinsmiths making everything from stands for selling ful medammes for breakfast to rat traps - so many rat traps - what sort of comment is that on life in Cairo? There is a marvelous machine that makes the finely shredded pastry for k'naffe. This looks like soft shredded wheat or the finest of vermicilli noodles. K'naffe is served in various forms all over the Middle East. It is a sweet often served as breakfast, but sometimes as a dessert as well. Imagine a stretching and buttery white cheese spread over a huge round flat pan. Cover this with the long strands of shredded pastry, finer than angel's hair pasta, and pat it down well. Drizzle it with butter oil - ghee - butter with the solids removed so it cannot burn. Bake over a low flame with a cover on top for about an hour. Then saturate the whole thing in a rich syrup flavoured with rose water. Scatter the now golden-orange top with dense green pistachios and cut into it. The pastry is crisp, the cheese hot and coming up in strings like mozarella, but the whole thing is hot and sweet, crisp and creamy and nutty with just a hint of tartness in the cheese. If I walk you through at this rate I am going to take hours to get to Bab Zuweileh and the Tentmakers' Suq. Bab Zuweilah is the one of the old gates of the old walled city of Cairo. There is a very tall and beautiful minaret on either side, and the whole collection of mosque, wall, outbuildings and gate date back to 1092 and that was a rebuild of a previous gate. 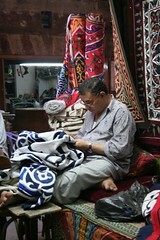 Opposite is the Tentmakers' Suq where men sit and stitch the most stunning hangings, all applique, in bright clear plain cottons. I have not been here for two months. While I have been in Australia Expertise Events (a large event organiser who hold the biggest Quilt and Craft Fairs in each State), have offered me space to hang a suitcase exhibition of work from the men here. There is a very large Quilt Convention in Melbourne in February next year, The Australasian Quilt Convention. 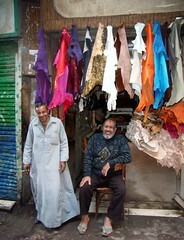 I will be teaching quilting and lecturing on the men in this suq, and other textile places in Cairo. I come here so often that I have many dear friends in this place. My friend and I had coffee, and tea, and orange Fanta (which I do not like)- all in different places. Business is not done in the Middle East the way it is in the West. We move straight into it. They sit and talk and enquire after the family. There is a deep and loving affection in the friendship offered by Arabs in the countires I have lived in. It is a closer bond than most western friendships, and I really felt that I had been missed, and was loved as we went from shop to shop, to be greeted with cries of "Miss Jenny, Miss Jenny". This is coming across as very 'memsahib-ish' - but it wasn't, I promise. They were thrilled and overwhelmed by the Expertise offer. I so wish I had the funds available to bring at least two of the men with me and with the exhibition, so one of the older men who is a truly brilliant applique worker could sit and sew to show people what can be done with some bright fabric and the most basic of tools, including bent needles and cast iron sheers a good fourteen inches long. The man I would like to bring has no English, but his son is good and fluent, and could answer questions and explain the techniques. There are three boys (well, maybe mid-thirties down to late twenties) and I would leave it to them to sort out which of them would come. If anyone has any ideas on people who might have access to some sponsorship - two fares to Australia from Egypt and accommodation there for six or seven days - please let me know. This is nothing at all to do with the Australian Government and I doubt if the Egyptian Government would see an advantage in backing something on such a small scale. The other thing I did today was something I have meant to do for ages. Just before I left in such a rush for Australia I had put a lot of my favourite 'people' photos on CD and taken them to be printed. From this I had selected the photographs taken in this area and I had them in my bag. We walked beyond the Tentmakers' into areas where tourists rarely find themselves. Outside one fairly old and scruffy mosque is an old man who sits there at all hours with a young girl who obviously has Down's Syndrome. He is very old, blind in one eye and it is clouded and opaquely white. He has the most wonderful face, autocratic and austere and he wears marvelously dignified deep blue robes with a white draped turban style head dress. The photograph on top was a portrait shot of him and because I knew exactly where he was I went there first. I approached him, he recognised me and started to raise his hand to acknowledge me. I held up the photograph and he squinted a bit with his single eye then realised what it was. I thought he was going to cry, he was so thrilled. He took my handsin both of his and held them tightly. He picked up his photograph (which had fallen when he grabbed me) and started to run around showing it to his friends nearby. His smile was a mile wide. He took the stool he usually sits on, grabbed my hand and marched me with the stool to a small 'shop' - like a little fabric surrounded shelter on the street. There was a woman there who looked at the photo, grinned and exclaimed, and who was so excited she could only have been his wife. The stool was carefully placed in the shade, and covered with a piece of newspaper and it was made very clear that I was to sit. Another was put beside it for Rod and he sat down too. There we stayed while half the neighbourhood crowded around to see the photo. At about this point I pulled the rest out of the bag and offered them to my old friend's wife. She started flipping, getting more and more excited as she recognised people and consulted with the seven or eight able to get their heads close enough to decide if it really was Um Ambdullah, or Abu Mohammed. Then she found herself. I didn't even realise it was her, different clothes and colours and pose, but there was no doubt when I looked at it. She kept giving little jumps and yelps in absolute excitement. Somehow it puts into perspective the poverty and pride of this area that a photo of yourself - something most of us have lots of in the west, could create such utter joy. I had not really thought about it but most of these people would never have a photo, would never own a camera or even really know someone with a camera. I made 'we must go' motions. No, we were quite firmly pushed back. We waited a while, and then the reason for the wait arrived. He had sent for two bottles of 7-Up, which probably cost him a few days salary. He opened them carefully with a bottle opener he had to borrow (old crown seals here) and they didn't have anything, then watched with a smile as we drank them. It was incredibly touching. It is now after two and my friend has arrived from the airport. So - in haste and some weariness - that scene repeated again and again as we moved around handing out photos - and it was exhilarating and marvelous. We also took lots more photos with people avid to have their's taken. So - I will go back again one day. I am just back in Cairo. It has been a complicated and often difficult period away. My daughter Kim is recovering so well. Her burns are healing and though she must wear pressure bandages for some time on her arms, her face is unscarred. My husband has had his hip replacement and other than enduring lots of 'hip' jokes - 'hip hip away', 'into hip hop', all 'hip and trendy' and so on - he is recovering well. He walks with a stick - when he remembers it. He has stayed in Australia on doctor's recommendations. Clotting is a serious risk after such surgery, and he has a meeting in Canberra that he must attend in early October. One flight would be a reasonable risk - three is pushing the envelope. He will return after the meeting in mid October. I have done my time around hospitals. I am not willing to spend time in another for at least a month or so. I have moved something like ten times, stayed in three houses, four flats, and a smattering of hotels - oh - and a hospital hostel. In that time I managed to make ten quilts - though three of these were tiny. Thanks to the generosity of Bernina I have sewn on round tables, dressing tables, small square tables and lacking my usual design wall I have draped pieces all over beds, floors, and curtains. I made nine for tACTile - the ACT group of quilt artists I work with - as these will start to travel in January and we need to have photography done. The other was a quilt for Kim. My lovely Southern Cross Quilters group on the internet, joined by a large number of Canberra Quilters, had sent 'healing hearts' - a six inch (finished) block with a green heart (Kim's choice of colour) on a cream background. 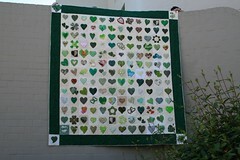 I joined them into a stunning queen sized quilt with a deep green border - and quilted it - in my last three days. A friend is binding it for me and will send it to Kimbi. Photos will follow as soon as I find Kate's Bible and follow instructions to do that as I have forgotten how! We flew in over Egypt and across the desert to the south, banked just in time to make sure we couldn't see the pyramids, then flew into what looked like a large dark grey bowl upended over the city. One of the things I have not missed is Cairo smog. This was 'official' travel as it had intended to be our midterm leave, so I was met by one of our lovely embassy drivers whose wife is due to deliver their new daughter any day and the conversation was all on pregnancies and deliveries. The sun was just risen as we drove in through the silent Friday morning, and buildings were bathed in golden light. It was almost romantic if you could just get past the dirt and rolladoors. I checked email, showered and slept for a few hours. I have visitors arriving within a few hours of my arrival and they wish to spend the afternoon at the Khan. It was about this stage that I realised that I have absolutely no Egyptian money. I walked the short block to the Bank Misr on the corner. At I drew level with it I was looking in an absent-minded way at the circular holes in the glorious polished dark green stone that surfaces the underside of the portico over the road. It is the sort of marble that we might use - at huge expense - to surface a kitchen bench top in Australia. Here it faces the building and even covers the undersides of the portico! I was wondering why they had cut circular holes in it, then realised they might be in the sort of locations that woudl take a light, and wondered why they were fitting new lights. Then I looked down as I stepped up to the footpath level from the road I was walking on. They have bricked up my bank. Worse - the handiteller was gone. A sign says that the bank is being rebuilt but it is in the 'total destruction' phase inside from what I could see. Probably the equivalent of the stage of tidying my bedside drawers where I upend the lot on the bed in the theory that I then cannot sleep till the drawers are sorted! Saudi was closed. Saudi is NEVER closed except between 2.00 am and 7.30 am. Oh - and midday prayer time on Friday. Perhaps a good clue would have been the street outside at the cross road covered with green plastic mats and men in prayer. Prayer time shifts according to sunrise - and because I have been away I have no idea when the midday prayers are at the moment. It was hot in the sun. Cairo has such a long hot summer. I had been watching temperatures while away and worrying about the unremitting heat - 37 to 40 most days and not showing signs of letting up. The asphalt at the crossroads is deeply embedded with bottle tops which have just quietly sunk into the tarmac, and I suspect archaeological digs of the future will reveal perfectly protected bottle tops embedded like nuts in peanut brittle and up to fifteen centimetres deep. Here the caps are all from soft drinks - in Australia they would be from beer bottles. As prayer time approaches all over Cairo people spread green plastic mats over the tarmac (without which I suspect archaeologists of the future might also find embedded knees)and left just enough space on one edge for the omnipresent taxis to squeeze through. This is to take the overflow from the small mosques and prayer rooms on suburban corners like ours in Zamalek. In a bid to get out of the sun I walked into the crowded coffee shop on the corner - Costas. It was cool and airconditioned and very pleasant. It smelt of terrific coffee. I explained my 'no Egyptian money' predicament and asked if I could sit and wait till Saudi opened. No problem. Then a waiter walked over to tell me that Saudi would be half an hour. Would I like a drink? I pulled out American money, Australian money and even some leftover rand. No problem. Pay later. I chose an iced coffee which was utterly delicious and texted my good friend Dagmar complaining that someone had bricked up my bank while I was away, and that the alternative was behind locked doors during prayer time. She wrote back mentioning the "battle between God and Mammon!" At this point I realised it was churlish to complain. Despite the importance of God in modern day Cairo, He only rates half an hour a week when He becomes more important than the matters of commerce. I was in an airconditioned coffee shop packed with chatting students, drinking a coffee on credit (welcome to Egypt!) and life was really pretty good. I watched the beautifully choreographed prayers from my very secular viewpoint. Stand. Hands flipped up, palms forward. Kneel. Prostrate from kneeling position. Hold for one minute. Up to knees. Hold. Stand. Repeat whole sequence five times. While watching I realised that very few Australians would show their devotion to their religion on a street corner. Here it felt very natural. The whole sequence of prayer in Islam - clean hands, face and feet, pray five times a day in sets of five and including a sequence of movements designed to keep men limber - makes so much sense as a guarantee of cleanliness, fitness, and social reliance on a set of rules intended maintain a social structure, to say nothing of a belief in God. Here and there an older man stood and bowed his head when others dropped to their knees. I suspect these were men who couldn't get down, or feared that if they did they would not get up. It was a nice welcome home - a bit of everything that Egypt could throw at me in a morning. Smog, a beautiful dawn, the affection of a very nice driver, a bricked up bank, Friday prayers, and then a coffee with a relaxed 'pay later' attitude that might be greeted with suspicion elsewhere in the world. Prayers ended, the supermarket opened, I found the handiteller working perfectly, and am now awaiting my friends and a visit to the Khan.